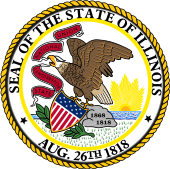 The Illinois Senate is the upper chamber of the Illinois General Assembly, the legislative branch of the government of the state of Illinois in the United States. The body was created by the first state constitution adopted in 1818. The Illinois Senate is made up of 59 senators elected from individual legislative districts determined by population; redistricted every 10 years, based on the 2010 U.S. census each senator represents approximately 217,468 people. Under the Illinois Constitution of 1970, senators are divided into three groups, each group having a two-year term at a different part of the decade between censuses, with the rest of the decade being taken up by two four-year terms. Depending on the election year, roughly one-third, two-thirds, or all Senate seats may be contested. In contrast, the Illinois House of Representatives is made up of 118 members with its entire membership elected to two-year terms. House districts are formed by dividing each Senate district in half. The Democratic Party of Illinois currently holds a majority in the Illinois Senate.